Well-known photographer, foodie and adventurer/newsmaker Peter Duffy collapsed and died of a presumed heart attack on August 4 while sitting on a wall outside the Davenport Shopping Centre in Glenwood, not far from his boarding house. Colleague and long-term friend, Graham Linscott who writes The Mercury’s Idler’s Column, described him as “a larger than life character and a wonderful raconteur” whose life was filled with adventure and he had the capacity to relate these adventures in a highly entertaining way. Born and brought up in Scotland, Duffy was educated at the elite public school, Gordonstoun, which was attended by Prince Philip and Prince Charles. After this he went to Tanganyika (now Tanzania) to learn coffee growing. Another colleague, Yogin Devan who joined the Sunday Tribune in 1980 shortly before Duffy became involved in the hijacking saga, posted these memories on Facebook. “When he returned to the Tribune after serving his jail sentence, I worked with Duffy regularly. Some journalists frowned upon his antics as a mercenary and hijacker and gave him a wide berth. I preferred going on out-of-town assignments with Duffy – the boredom of long trips disappeared as he regaled me with stories about all his adventures. I also decided that Duffy could be handy when interviews became tricky – he had a black belt in karate. “Duffy and I went on several exciting and dangerous missions into the then Transkei and Ciskei – and once got caught in the violence following a coup in Bisho. “Duffy was most knowledgeable about gourmet cooking and alcoholic beverages. He bragged about cooking a good few last suppers when he was in Pretoria Central Prison. He recalled that one condemned prisoner’s last meal request was scrambled eggs. Duffy was also a connoisseur of cocktails. “When I left journalism, Duffy and I kept in contact. In October 2016, I was responsible for arranging the cordial meeting in Mumbai between Duffy and Captain Umesh Saxena, the pilot of the Air India plane that Duffy and his fellow mercenaries had hijacked. They shared their versions of the episode over beers and a meal. It was believed to be the first such reunion between an aircraft hijacker and a pilot. A group of Durban professionals and businessmen decided to promote the publication of Duffy’s life story and Graham Linscott was selected to write it, having known him for more than 40 years. 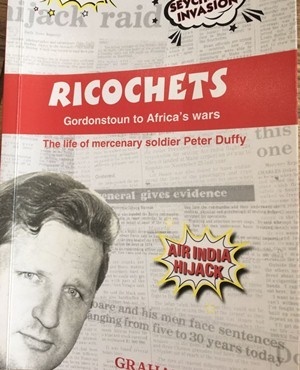 The book is titled Ricochets: Gordonstoun to Africa’s Wars. “How absolutely extraordinary and sad it is that he should die as it was being printed,” says Linscott. Ricochets will be officially launched on August 17 at Adams in Musgrave Centre, Durban.